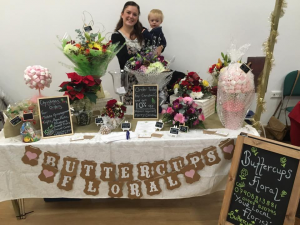 Buttercups Floral are your local independent florist based in Oxley Park, Milton Keynes. We are passionate about creating quality modern and vintage floral designs for all occasions, such as Weddings, Anniversaries, Births, Birthdays, Funerals and much more. After more than 14 years gaining valuable experience working as a florist and spending 7 years managing a successful florist shop, after a short maternity break for our first child I decided it was the perfect time to launch Buttercups Floral. I found my passion for floristry at 16 when I started working as in a local florist shop. I pursued my passion and began training as a florist at 17, working and completing an NVQ level 2 & 3 in floristry. My passion has grown over the years and each order inspires and excites me to use my creativity. I take my inspiration from working closely with customers to ensure I create designs bespoke to their requirements and from current trends. I am passionate about using the best quality flowers to ensure all of our designs look stunning, to do this our flowers are sourced from high quality growers in Europe. We are so confident you will love our flowers as much as we do we guarantee to replace any arrangement you are not 100% satisfied with.